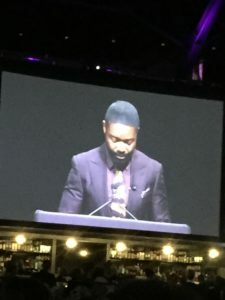 David Oyelowo, British-Nigerian actor in “Selma” spoke with the same eloquence with which he acts. Speaking of portraying MLK as the main speaker at Martin Luther King Breakfast. He addressed power and privilege and it’s many implications. Growing up in the UK, he found his humble roots were of royalty in Africa. When experiencing his father’s native country he experienced humility by, and with, the people. Royalty includes all. When arriving in the United States he experienced a different type of power and privilege. Completely different. At Minneapolis Central Library, retired Supreme Court Justice and former Vikings stand out, Alan Page and his wife Diane, provided to the masses, a powerful display of African American artifacts titled “Testify”. 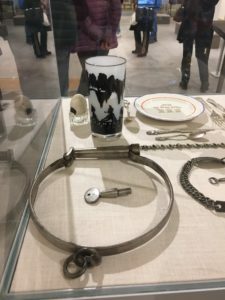 Noted above is a collar worn by a slave. 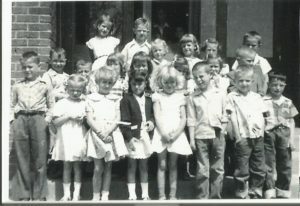 There were many collars and keys. The owner held the key. Power and Privilege. These events took me back to again watch Ken Burns Civil War Documentary mini-series and again, I asked the question, “How far have we come?” “How far did the bloodshed take us?” Today the question is still a question. 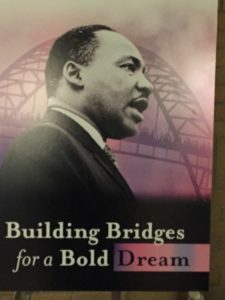 Star Tribune printed an article about reconnecting a walking bridge with the idea of joining together the Saint Paul Rondo community, one of our African American Community torn apart by the Federal Aid Highway Act of 1956 with the construction of the I-94 Freeway. We know the impact of that decision. Or do we? The Highwaymen by Josh Wilder and directed by Jamil Jude detailed the cost in homes, businesses and a community torn apart, yes, torn apart. Changed forever. Decisions made with no sensitivity or care to the people involved or the long term impact. Power and Privilege. Graduate of NYU, superb writer, amazing and beloved educator at a Catholic all girls high school, my daughter in law teaches English. She is the mother of five of my eleven beautiful grandchildren. She shared with me a poem she wrote just last week as part of a project with her students. Ironically, it is titled Power and Privilege. The poem speaks for itself. 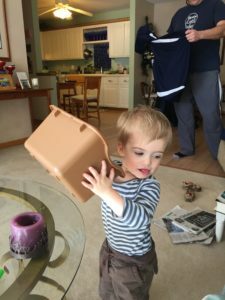 The subject–my adorable youngest grandson pictured above. Nicolas Theodore Sutton,-a heart taker and spirit maker. Seizes hold of your heart. And a new existence stretches before you. And terrified of your new master. Is there a hair thread around some tiny body part? Does he feel warm to you? Are his eyes supposed to do that? Why is he sleeping so—not sleeping so much? Really, why did you just dirty the clean diaper I literally put on you two minutes ago? Were you waiting for me to put you in that clean diaper just so you could poop? I just fed you – you can’t possibly be hungry. You’re kidding me. You’re seriously hungry? What the heck is in this breast milk? And yet he would never dare to demand. —All part of this willing captivity that finds me, at times, so at odds with myself and yet so at peace within myself. David Oyelowo, Martin Luther King, Ken Burns, a collar, Alan and Diane Page, Rondo and Nicky. Impacted by Power and Privilege. Womb to tomb, ALL life is sacred. And all life has power and privilege. It comes through loving one another.